Airtel digital TV is an Indian direct-broadcast satellite service provider owned and operated by Bharti Airtel. Its satellite service, launched in 2008, transmits digital satellite television and audio to households in India. 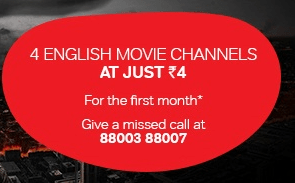 As a promotional offer, Airtel is offering 4 English Movie Channels addon at just Rs.4 only for your first month. After 1st month you will be charged at Rs.40 / month. Hurry, Grab this offer now! Note – After 1st Month you will be charged a normal rate of Rs.40/month.